coming out in November! Fun! This new book contains over 150 low-calorie recipes that take only 30 minutes or less. They contain no added oil, processed foods or artificial sweeteners. Very Plantcentric! PLUS, for the first time, she includes basic workouts, tips & tricks, her personal fitness regime, demo photos of each exercise and an all-in-one “body bash.” All her recipes in this book are 350 calories or less. 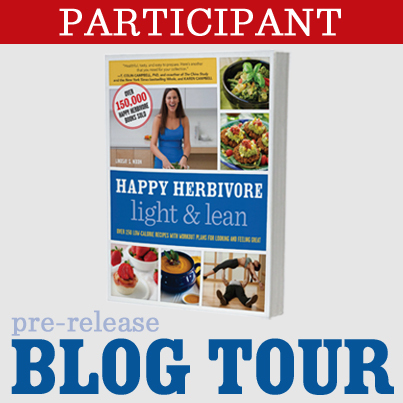 What I love about Happy Herbivore recipes is that they use everyday ingredients and are quick, healthy and easy. I go back to her cookbooks over and over again. As a matter of fact, my husband is in the kitchen right now making her Vegetable Korma from Happy Herbivore Abroad! I love behind-the scenes info! How do you come up with your recipes, and what is it like in your kitchen when you’re experimenting, cooking, tasting, etc? Lindsay: It’s a giant mess! 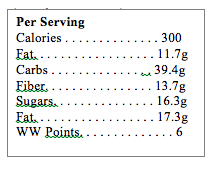 When I’m working on a cookbook, I pretty much spend 8-10 hours in the kitchen cooking and trying things. By the end of the day my sink is overflowing with dirty dishes. There isn’t a single clean spoon in the house. Every spice is on the counter. The pantry has been stripped down, its contents all over the counter, table, floor…My husband and dogs won’t even come in the kitchen until I’m done. LOL! Do you ever have any flops? Do you have tasting parties? Lindsay: I have a wonderful team of testers who test all the recipes in their home for me – to make sure it works, comes out, tastes good, etc. 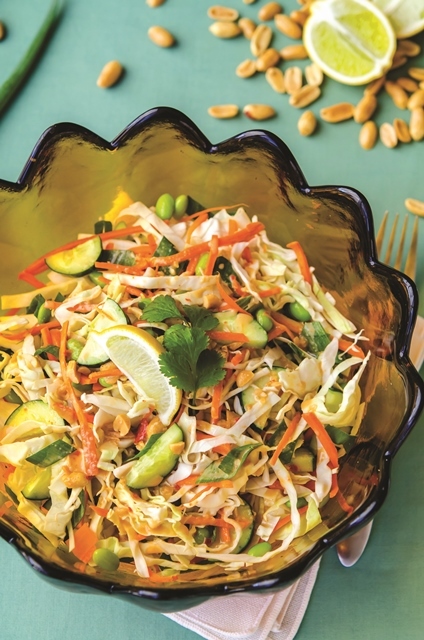 I asked Lindsay if I could share with you her Thai Crunch Salad with Thai Peanut Dressing that will be in her new book Happy Herbivore Light and Lean, and she graciously agreed! 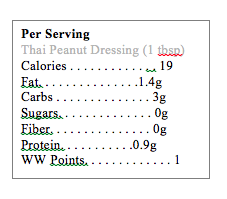 Creamy, delicious—here’s a lower fat and lower calorie DIY peanut sauce. 10–20 seconds (so peanut butter is melty), whisk into a sauce, and then whisk in nondairy milk. Taste, adding more hot sauce as desired. Chef’s Note:For a richer sauce, substitute coconut milk for the nondairy. 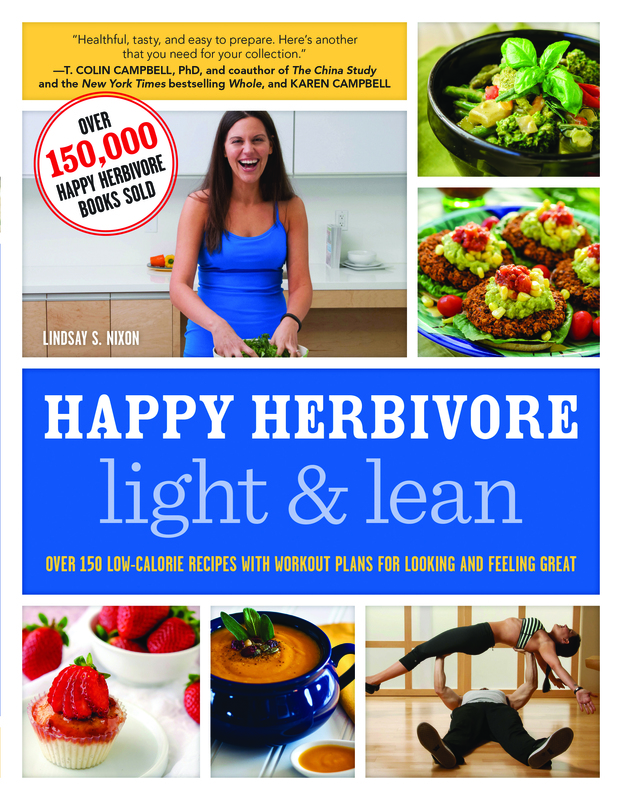 You can pre-order Happy Herbivore Light and Lean right now!